Can I skip the line at Madame Tussauds? What is the difference between Gatwick Express and Gatwick Airport Train? When will I receive my ticket for Gatwick Express/Gatwick Airport Train/Stansted Express? Is there transportation included in the Harry Potter & Warner Bros. Studios Tour? London is a very popular destination, and many attractions sell-out weeks in advance. 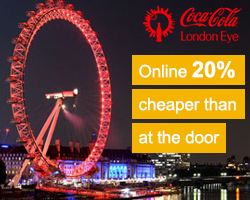 We strongly encourage booking tickets just as soon as flights to London have been secured! By booking in advance, you will also save time by not having to stand in the long lines at the ticket offices. Our tickets give you access to a special entrance for pre-booked tickets, which is usually a shorter queue than the regular box office. Please note that during high season, especially during fall vacation, spring break and other school and public holidays longer queues often occur. Also midday between 12 PM and 15 PM is always the busiest. The Gatwick Express is a non-stop service to central London from Gatwick. The Gatwick Airport Train is a local commuter train service run by the operator Thameslink. On average the journey time is about 15 minutes longer with the Gatwick Airport Train. Kindly note that the Gatwick Express stops at London Victoria Station, while the Thameslink Train is bound for St. Pancras - King's Cross – both are located in central London. You will receive your train ticket in a separate mail within 24-48 hours after completing your booking. Yes! Round trip transportation by bus is included in the Harry Potter and Warner Bros. Studio Tour. The tour ends at Victoria coach station. The starting time stated on the booking page and on your voucher is the time the bus will be departing from London. If you wish to arrange private transportation to/from the Warner Bros. Studios you must call our local agent in London and arrange this a few days prior to your visit (the phone number is printed on your voucher). Please note that this tour can be fully booked with short notice, especially during high season. If sold out we will contact you immediately with alternative dates or offer a full refund.